Guest post – Eat, blog, sleep | eat. live. travel. write. When my fellow Aussie born food blogger friend, Miss M, over at www.eatlivetravelwrite.com asked me to write a guest post, I immediately thought “whatever recipe I write about, it has to be Australian”. Now this might sound simple enough to you all, but in fact, it’s actually very difficult, as us Aussies don’t really have a traditional ‘cuisine’. While the Japanese have sushi, the Italians have pasta and the Brits have Beef Wellington, the closest thing we have to a national dish is a lamington! I definitely didn’t want to write a post about these squares of sponge cake covered in chocolate icing and coconut (Editor’s note – “Why not??? ?”) and then it hit me … my Bacon Wrapped Barramundi would be perfect. It is everything modern Australian cuisine represents. Fresh Aussie ingredients incorporating the flavours of the world that have been introduced to Australia by the many cultures that have settled in Australian and make it the great place it is today. This dish was actually inspired by a Jamie Oliver recipe I read in a magazine at a doctor’s office one day but has been ‘Australianised’ with the use of Barramundi, a fantastic Australian fish. If you can’t get Barramundi, feel free to substitute with any firm fleshed white fish you prefer. I like to serve this with steamed baby asparagus topped with a very thin preserved lemon & dill aioli along with some boiled new potatoes. 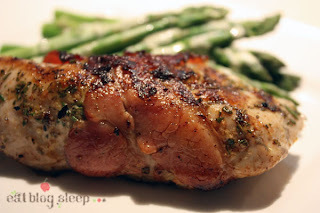 I hope you enjoy this recipe and don’t forget to check out my blog www.eatblogsleep.com! 1. Rub the Barramundi fillets with olive oil, season with salt and pepper and then sprinkle with the lemon zest and rosemary. If you have time, allow to marinate for an hour. If not, proceed with step 2. 2. Using a meat mallet, beat the bacon out so it is paper thin. Wrap the fish in the bacon and secure with a toothpick. 3. Heat a grill pan or fry pan to high heat and brush with a little olive oil. Cook the fish for 3 minutes on each side. 4. Serve with baby asparagus and preserved lemon & dill aioli. mmm, you don't have to Australian to appreciate bacon and a flavorful fish fillet. Cheers! that looks delicious! would you share your dill aioli recipe too? not that I like fish, it looks awesome!! Was that based on a chicken recipe? Jamie does a great posh ham, parmesan chicken wrap which is Divine! !